FYI: My recent inability to shut up about this trilogy is 100% Julianne's fault. 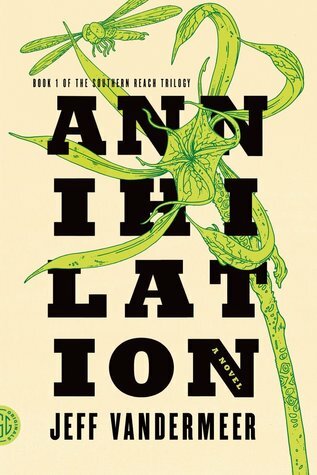 The Southern Reach Trilogy by Jeff VanderMeer comprises Annihilation, Authority and Acceptance. The first is sub-200 pages, with the latter two close to 350 each because VanderMeer is a tease. I finished Annihilation at the start of February was really hoping I could read all of these around the same time and post a hefty, well-organized review. 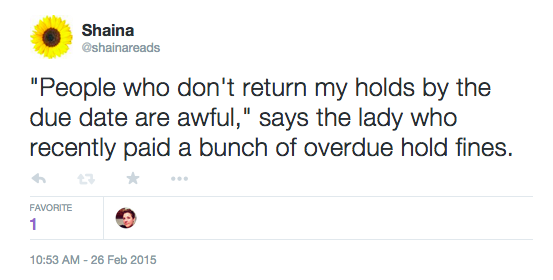 Alas, the library gods were not on my side. The other two books came in five days after I tweeted this. I'm going to be sad about my first world problem and post my thoughts on Annihilation in the meantime. Annihilation introduces us to the all-female team of the twelfth expedition to Area X, a stretch of wilderness cut off from civilization after a mysterious, unknown "thing" happened there. The Southern Reach, an equally mysterious agency, sends teams of scientists into Area X to investigate its weirdness. Because it's really weird. There are creatures that moan in the night, spore-spewing/message-writing plants and pulsating, possibly living buildings that don't show up on maps. Explorers from previous expeditions come back from Area X placid and hollow or don't come back at all. Add in that not all the expedition members are on the same page, and we've set the stage for a LOST-esque creepfest. I'm hesitant to share much more, because I feel like this is a book that defies summary. It's also only part one of a larger story, so it's difficult to analyze it on its own. I did feel that it occasionally got too caught up in its own grander ideas; it was less "What's going on in Area X?" and more "What does what's going on mean?" I don't mind getting meta, but sometimes it gets in the way of the thread of a story. All in all, this book was (you guessed it) weird, and I'm excited to see where VanderMeer takes Area X and the Southern Reach next. I would recommend it for people who enjoy supernatural elements and grand philosophizing with their sci-fi. This sounds fascinating and, yes, weird. I hope the person returns the next book to the library soon so you can read it! Unfortunately, Book #2 did not rock my socks off (we're talking 2.5-territory). Still working on #3 because I'm invested enough now to want to know what happens. I'll be sure to post reviews when I'm through! You're making me want to read this again!! Do it! It's so short. I'd say that this review isn't spoiler-y (though the one I posted today definitely is) if you want to read it!